3M® HEAT TRANSFER (Iron-on) SCOTCHLITE REFLECTIVE TAPES - are available as 5410 Diamond Mesh, 5510 Comfort Trim, and solid 3M 8712 silver-gray, all of which reflect bright white and are ANSI certified. Solid 8712 is 3M's less expensive mainstay heat-transfer reflective film. We also carry 3M 8787 in a solid fluorescent yellow. All these reflective tapes are for T-shirts, work clothes, jackets, running and bicycling clothing. 3M 5410 Diamond Mesh has diamond shaped openings and a green removeable liner. 3M 5510 Comfort Trim has diagonal reflective segments (left or right-leaning) with a blue removable liner. 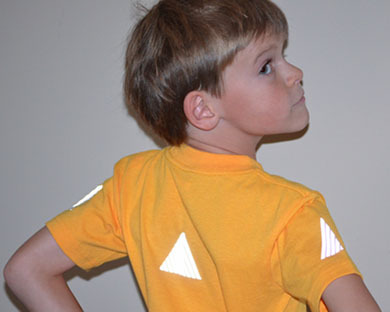 Both provide superior reflectivity and breathability. 3M 5686 and 5687 fluorescent orange and yellow flame resistant segmented comfort trims are also lightweight and comfortable to wear. They offer great daytime conspicuity in foggy or gray weather and are night-time reflective. Once applied and the liner removed, these films reflect bright white before vehicle lights. 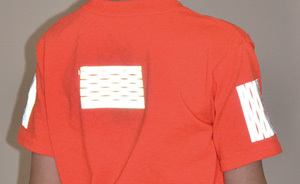 All these reflective tapes are absolutely great for T-shirts and can be easily cut into shapes and strips to create patterns and images (see image at top). They bond exceptionally well to nearly any porous material by penetrating into the fabric (but they may not bond well to waterproof materials). They are home machine washable at temperatures up to 140°F and low dryer settings, but it is recommended to wash them on warm (105°F) and line dry to best preserve reflectivity. Only non-chlorine bleach is recommended. For application instructions, see our instructions Here. For more details about application and cleaning, see specifications. 3M silver exceeds ANSI Level 2 standards (500 Cd/Lux/sq.m) for reflectivity. For clothing that is bulky or heat sensitive, see 3M 8850 adhesive reflective tape. Both 3M 5410 Diamond Mesh and 3M 5510 Comfort Trim below are advanced heat-transfer reflective films that bond permanently to T-shirts, jackets, coveralls, and clothing. Segmented 5510 provides stretch and flexibility as well as being cooler to wear in hot weather. It is so breathable, lightweight and comfortable that you'll forget it is there. Both are great for bikers, runners, and anyone who wants to be more visible in fog and darkness. Both 5410 and 5510 can be cut with scissors to create your own interesting shapes and patterns. For further data and application instructions for 5410 Diamond Mesh see3M 5410 Specs. For further data and application instructions for 5510 Comfort Trim see 3M 5510 Specs. 3M 5686 and 5687 Flame Resistant comfort trim below are exceptional personal safety reflective products. If you are a wildfire fighter, this trim is for you. It is lightweight and breathable to help keep you cooler and sweating less. It is also as great for bikers, runners, and anyone who needs to be visible in fog, low light, or darkness. The fluorescent colors show up very well in fog. For further data and application instructions, see Specifications.